Ａndrea Ginzl Greer earned a Bachelor of Arts in the Humanities with a minor in History from the University of Maryland University College. After graduation, she began teaching English/Language Arts at the 7th grade level in Jacksonville, Florida. Within her first year of teaching, she earned a minor in Education from Florida State College. She taught in the Florida public school system for five years. Ms. Greer was hired with the Department of Defense in 2010 and moved to Yokosuka Japan . Ms. Greer is currently earning her Master’s Degree in Instructional Technology. Ms. Greer grew up in Florida, the southern region of the United States. She briefly lived in North Dakota and Georgia when she was serving in the United States Air Force. Ms. Greer has a passion for reading and writing. She also is also an avid cook, trying new recipes and sharing her meals with family, friends and neighbors. Ms. Greer enjoys traveling, especially visiting areas of her new country, Japan. She recently returned from a three-week visit to China. 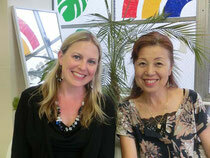 Ms. Greer lives in Zushi-shi with her teenage son. They are both very happy to be living in Japan and look forward to all of the experiences that Japan has to offer.